Slitherine combines with Games Workshop for a second time. There are a lot of Warhammer games out there at the moment—a list which is about to get even bigger before the end of the year. 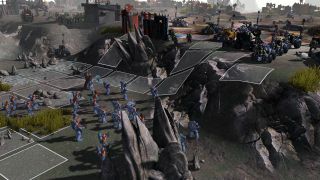 Scheduled to arrive in November 2016, Warhammer 40,000: Sanctus Reach is a 3D turn-based strategy affair—published by Slitherine, and developed by new studio Straylight Entertainment—that’ll see players leading “several dozen” Space Wolves units to war against the Orks via two story-driven campaigns: Stormclaw and Hour of the Wolf. According to its newly-launched Steam page, Warhammer 40,000: Sanctus Reach will come packing multiplayer and skirmish modes, as well as a map generator, when it lands in November. Full details of that and more can be found in this direction.